Our self contained Studio / one bedroom unit is different... Bedroom with ensuite and big balcony with great sea views are upstairs.Going down on external stairs to the car park and living room with kitchenette. Equipped with 32inch TV, DVD, It has a covered deck. Walkways through the garden. There is also a place with an amazing view for a glas of wine, tea or coffee. We can help you with informations for boat trips, kayak tours, renting mountain bikes, booking beauty- and massage treatments and wine tours. We also give you informations about the local area. External stairs between living room and bedroom. Linen and towels supplied but no service. We stayed for 5 nights at this property and everything about it was extremely comfortable, the seating, the beds, spotless, with lovely views from the balcony where we often breakfasted or sat enjoying a glass of wine as the sun went down. It was very close to the beach and only a 10 minute drive to the Abel Tasman Park. Barbara and Deitmar were outstanding hosts. Would definitely recommend a stay here. We would welcome your return one day. Great location with views of the sea and bush. Perfect place to stay for exploring this area. Comfortable accommodation on two floors with seating provided on decking and another table and chairs on lower floor outside the sitting room/kitchen/dining area, so lots of choice! Lovely hosts, Barbara and Dieter, who couldn't have been more friendly and helpful, but respectful of our space. So enjoyed our stay and would definitely choose to stay here again if we are ever in this area in the future. We would happily go there again, views outstanding. My partner and I stayed at this studio for a week to get a break and celebrate his birthday. The hosts were absolutely amazing to us. We were very well looked after and our every need or requirement was attended to. The hosts are the most welcoming hosts I have ever met. They had amazing local knowledge and were extremely accommodating. I recommend this studio to anyone who wants to enjoy this part of New Zealand's beauty and have a fabulous time. The kitchen had a bunch of local brochures on attractions and events in the local region. The hosts definitely made this a holiday we both won't forget and we will be back in the next year to enjoy this amazing place, and the tranquil garden overlooking the beach. This place is on the hillside just behind Kaiteriteri and about a ten minute walk, or a five minute bike down to the main beach. On a side note, anyone that wants to spend the evening outside enjoying the beautiful scenery, I would recommend bringing citronella candles that will deter the mosquitoes that do frequent the Kaiteriteri and Abel Tasman area at times. Thank you very much for looking after us, and having us. It was an absolute pleasure. G&J. A beautifully appointed studio unit with a lovely view of the bush and sea. A beautifully appointed studio unit with a lovely view of the bush and sea. Very peaceful and tranquil. The Studio is in a great location, close to Abel Tasman, but quiet; very well appointed throughout with wonderful upstairs bed and and bath. 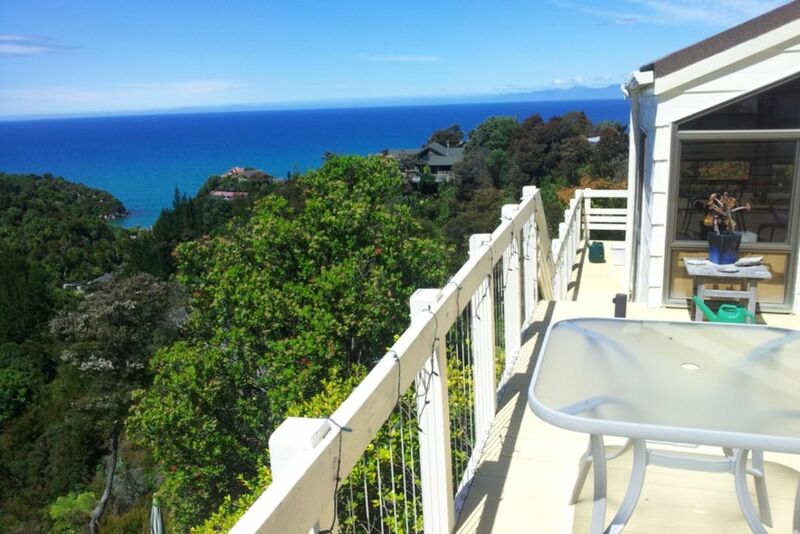 The deck off the bedroom has a beautiful view over-looking Kaiteriteri and the Tasman Sea. Kitchen was well equipped as well. It was difficult to say farewell to our lovely hosts and this special place in the world.